The ISIS group claimed responsibility for the latest attack in the Afghan capital, which comes a day before the government's ceasefire with the Taliban is expected to start. Kabul: At least 12 people were killed and 31 wounded when a suicide attacker blew himself up among government ministry employees in Kabul who had left work early for Ramadan and were waiting to take a bus home, officials said. The blast occurred at the main gate of the Ministry of Rural Rehabilitation and Development, police and health ministry spokesmen told AFP. Employees were gathered at the entrance of the compound waiting for a bus to take them home when the suicide bomber blew himself up in the crowd, said rural ministry spokesman Faridoon Azhand, who was inside the building at the time. "I was in my office when I heard a big blast," another employee told AFP. "Most of my colleagues were leaving for the day to go home. I am worried about my colleagues. We are told to stay inside for now." Police spokesman Hashmat Stanikzai confirmed the attacker had targeted the employees as they waited for the bus at around 1:00 pm (0830 GMT). They were leaving early due to the holy month of Ramadan, when most Muslims fast from sunrise to sunset. ISIS claimed the attack via their Amaq propaganda agency. The attack was just one of several around Afghanistan Monday. Elsewhere, terrorists raided a government building in the eastern city of Jalalabad in Nangarhar province, prompting terrified employees to jump out of the windows, officials said. A suicide bomber blew himself up at the entrance to the education department, triggering a fierce battle between gunmen and Afghan security forces, Nangarhar provincial governor spokesman Attaullah Khogyani told AFP. At least 10 people were wounded, city health department director Najibullah Kamawal told AFP. In another incident, an explosion inside a house in Kabul killed one person and wounded three others, Stanikzai said. The three wounded were detained after police found explosives, including suicide vests, in the building they suspect was being used by militants planning attacks in the city. 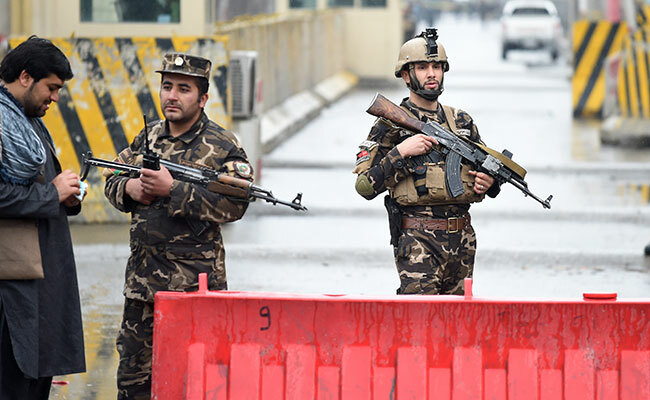 Taliban and ISIS terrorists have stepped up their attacks on Kabul in particular in recent years, making it the deadliest place in the country for civilians. Afghan President Ashraf Ghani on Thursday announced security forces would halt hostilities with the Taliban for a week -- though he warned that operations against other groups, including ISIS, would continue. The ceasefire would last from the "27th of Ramadan until the fifth day of Eid-al-Fitr", he said, indicating it could run from June 12-19. The Taliban said Saturday their fighters would stop attacking Afghan security forces, but only for the first three days of Eid, the holiday capping Ramadan. They said they would continue attacking US-led NATO troops. It is the first time the terrorists have agreed to suspend fighting since the 2001 US invasion, and the move was largely welcomed by war-weary Afghans. If it holds, analysts had expressed cautious optimism that the agreements could help build trust between the government and the Taliban and lay the groundwork for peace talks. But with myriad armed groups in Afghanistan, there are still fears that ISIS could continue to carry out attacks -- or even be helped by the Haqqani Network, a brutal arm of the Taliban that are suspected of partnering with ISIS on attacks in Kabul in the past. The latest violence comes as dozens of protesters march hundreds of kilometres towards Kabul to demand an end to the nearly 17-year conflict.